Atta Mohammad was born 1965 and raised in Balkh Province in the city of Mazar-i-Sharif. He is an ethnic Tajik but he is half-Tajik only. Originally, Atta comes from Logar province. His wife is the cousine of Mr. Qanuni´s wife, both women hailing from the Pashtun province of Nangarhar. He was a hgh school teacher after the soviet invasion. Atta Mohammad previously served as the Commander of 7th Corps of Northern Afghanistan until he was appointed Governor by Hamid Karzai. During the war against the Soviets, Atta Mohammad served as a military commander for Burhanuddin Rabbani's Jamiat-i Islami. He and Abdul Rashid Dostum are bitter rivals dating back to the Soviet war when he and Dostum fought on opposite sides. Also a rival clan leader to Atta is Commander Akram Khakrezwal. After the Taliban lost control of Mazar-e Sharif, Atta Mohammad's forces and forces loyal to Dostum clashed several times against each other for dominance over the city. Ata is under enormous pressure. Since Afghanistan has become peaceful, the former mujahideen commander, has ruled the province with an iron grip. He managed to kick his rivals, Abdur Rashid Dostum, the Uzbek leader, and Haji Mohammad Muhaqqiq, the Hazara leader, out of the province without using force. Dostum relocated to Sheberghan, capital of Jowzjan province, Muhaqqiq went to Kabul, and Atta Noor has purged the government of almost all other ethnic groups. In the confusion following the overthrow of the Taliban, Atta Noor took over Mazar-e-Sharif while other forces were busy purging the north the Taliban forces. Noor is still affiliated with the Jamiat-e-Islami party, the dominant party in the mainly tripartite Northern Alliance. He was the commander of the Seventh Corps of what UN disarmament experts politely refer to as "Afghan Military Forces". Atta Mohammad at the time of the fall of the Taliban commanded some 20,000 troops. He had close ties with Afghan Defense Minister Mohammad Qasim Fahim, with whom he was a member of Jamiat-e Islami, a predominantly ethnic Tajik political grouping. Governor Atta is in opposition to Karzai and traveled to Usbekistan on 20091119, where he had shifted his family 3 months ago. Plenty of rumors were heard in Mazar-e-Sharif which range from medical treatment to organizing resistance against der Karzai Government. He was meeting Russian and Usbek politicans to assess his political options after the reelection of President Karzai in 2009. 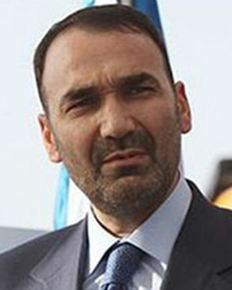 Atta Mohammad Noor was the only provincial governor to openly support Karzai’s rival, Abdullah Abdullah, in the August 2009 election. This opposition has given rise to concerns of violence if the central government decides to attempt to reign in Atta’s power. The leaders of Balkh’s two other primary political parties supported Karzai. Critics, however, have claimed that Mohammad Noor has become wealthy through his leadership by leveraging his large degree of informal power in order to secure lucrative business deals for himself. Others claim that he has effectively stifled opposition or dissent to his rule over the province through force and intimidation and runs the province as his own personal fiefdom. Atta continues to control a private militia force in the province and has allegedly infiltrated his supporters into the official security services. To Atta´s ethnicity, he is half-Tajik. Originally, Atta comes from Logar province. His wife is the cousine of Qanuni´s wife, both women hailing from the Pashtun province of Nangarhar. President Ashraf Ghani has approved the resignation of Atta Mohammad Noor as governor of northern Balkh province, Ghani’s office said on Monday Dec.18, 2017. A statement from Presidential Palace said that Noor had already resigned. However, now Ghani accepted his resignation.